The owner of this kitchen was looking for the beauty found in natural Carrara marble, but durability was of utmost importance for the island. 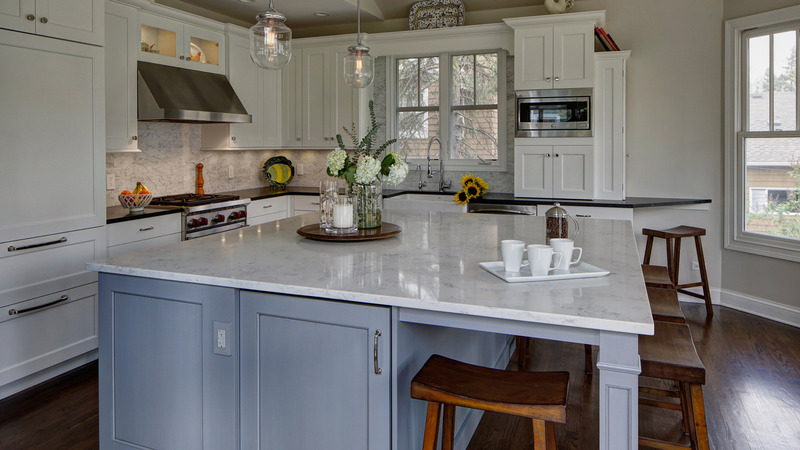 The perfect beauty and durability combination was struck by creating the elegant Carrara subway tile backsplash, and choosing Difiniti Viareggio quartz for the island. The cool striated gray/blue combo on the island cabinetry by Grabill blend delightfully with the warm original oak wood floors to create the perfect temperature in the room. Contrast was tastefully accomplished by the Kohler apron front sink and the Raven honed granite countertops. Strategic storage options like deep drawers for pots and pans, utensil dividers, knife blocks and spice rack, extra island storage make this kitchen functional as well as beautiful.